So I decided to make some peanut butter cookies this afternoon since I missed out on my usual cookie making during the week due to the transit strike! Beat butter and peanut butter in large bowl until light and fluffy. Add sugar, corn syrup, egg and vanilla; blend well. 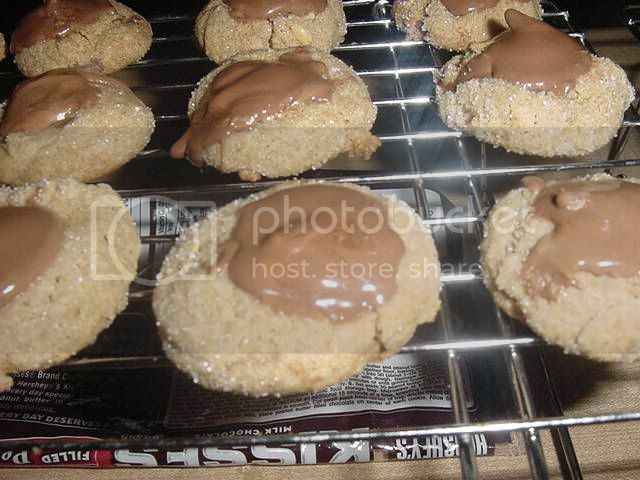 Stir together flour, baking soda and salt add to peanut butter mixture, blending well. Shape dough into about 30 (about 1 1/4") balls. Press a kiss into each ball, covering completely with dough; reshape into balls and roll in granulated sugar. 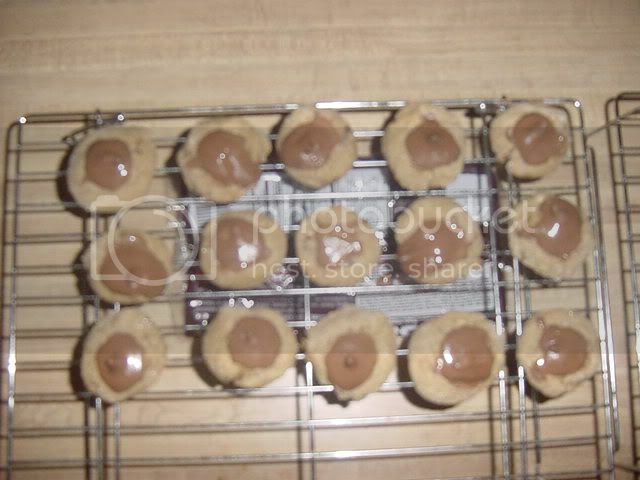 Place on ungreased cookie sheet and bake for 10-12 minutes, or until golden brown around edges. Cool slightly on cookie sheet; then cool completely on wire racks. Set aside 30 kisses and place remaining ones in a heavy duty resealable plastic food storage bag (I used microwaveable bowl). Microwave at 50% for 1 minute and knead. If necessary, microwave at 15 second intervals, kneading after each heating until chocolates are melted and smooth. Cut small piece from corner of bag and drizzle chocolate over cookies. Place a kiss in the center of each cookie.